You don’t ask questions… you just stop and drink it in. In 2009 The Macallan issued a statement saying that they had passed Glenfiddich to become the second largest producer of single malt Scotch in the world, behind only Glenlivet. The Big 3 definitely stand far above the others in production, and, fortunately for us, they have achieved this scale without sacrificing quality. No small feat. 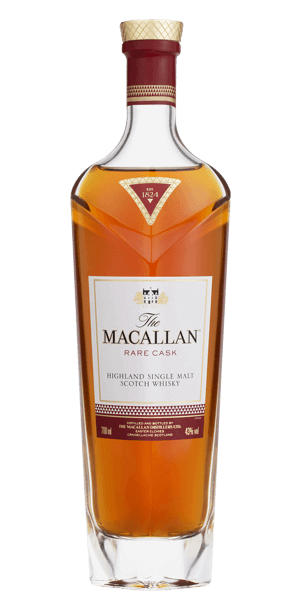 Macallan Rare Cask is a single malt of the first order. Every drop is pure Macallan, and all of it is aged in Stuart’s carefully acquired Sherry casks. This is where Bob Dalgarno comes in. Bob is the Official Whisky Maker, and he gets the awesome and intimidating task of blending Macallans of various casks and ages to achieve a special flavor profile. If it needs a little citrus and stone fruit, add younger Whiskies. If it needs more chocolate and wood spice, add older. Taste is the key… and with Macallan Rare Cask, taste is achieved. Even the packaging is special. The bright red box swings open like French doors to reveal the cut crystal decanter with a perfect taper and plunging neckline. But you won’t find an age stamp on the beautiful packaging that it comes in. A gentleman never asks. Besides, that is just the gown … the dressing for the luscious spirit within. The color is a light mahogany, the flavor gently sweet and rich with a full body, intoxicating aroma, and a mouth-feel that is … sensual. Cheers to Stuart and Bob … nice job lads. What does The Macallan Rare Cask taste like? The Flavor Spiral™ shows the most common flavors that you'll taste in The Macallan Rare Cask and gives you a chance to have a taste of it before actually tasting it. Orange zest, chocolate and spice. Raisins and oak, vanilla, milk chocolate, and walnuts. Warming, Grand Marnier Cognac and cocoa. Very good but at this price point I expect a little more than very good. Macallan makes a great product it's unfortunate that almost every bottle I've tried is good but not good enough to justify the price. The best I’ve had so far. Shockingly smooth. Expected nothing like the heaven I tasted. Got this as an anniversary present for $375 a few years ago and the flavor is not worth the price. WOW! Fantastic dram! It is amazing both neat or with a small ice cube. Incredibly smooth and the tastes of vanilla and dried fruit are obvious but not overwhelming. By far one of the best whiskeys I have had. This was actually pair with dessert and it was perfect. It is gentle from the tip of the tongue to your stomach. I highly recommend this whiskey to anyone (young or old). Amazing. Smooth. Oak and cinnamon up front. Mellow in the middle. Long leathery finish that lingers but does not burn. Mildly peaty. His ruined all other scotch for me. Fantastic Scotch! Best I have had thus far! Loved it, just too expensive to drink all the time. This review is for the 9 year old cask strength matured in Sherry casks. Hints of maple syrup and spice, with a smooth finish after the burn! It's one of the best I've owned or tasted. The best and smoothest I have ever had. Very well rounded. Great from start to finish. Very smooth. This is a very nice little tipple. Not "M", but a very fine whiskey in its own right. A really fine whiskey. Thoroughly enjoyed it. Not the biggest Macallan fan, great flavors but not a lot of depth or dimension. Enjoy the 15 more over this one. @ robert, arrggghhhhh me hearty! but seriously; i fell in love with a 25 Y.O. MacAllan received as a gift from my Irish employers/friends in 1986 when i was the last bartender out the door as they closed Shaunasee's in Santa Ana that year. Pat and Kevin were great Irishmen but neither had a CPA! i was still partaking of that bottle in 1993. wish i had had the strength to keep it longer. that, and Martell Cordon Bleu are my two favorites liquids of all time.